“It is of the nature of desire not to be satisfied, and most men live only for the gratification of it.” – Aristotle. Above: Why Are We So Unhappy? Above: Humans Are Already Cyborgs. “Our destiny is to become what we think, to have our thoughts become our bodies and our bodies become our thoughts” – Terence McKenna. somewhere along the way it seems that we must become machines” – Erik Davis. Above: Pluto Could Be Made A Planet Again, Along With 102 Other Celestial Bodies. This proposed new definition of “planets” would bring back Pluto, but would also reclassify over a hundred other celestial bodies, including our moon. Macy’s Versus L Brands – Is Macy’s A Buy With An 8.2% Dividend? *Macy’s is still profitable and has an 8.2% dividend. *Macy’s has lost over 50% of its value over the last 12 months. *L Brands is very profitable and has a 5.1% dividend. *L Brands has lost approximately 28% of its value over the last 12 months. The last 12 months have been extremely painful for fashion retailers with many fashion stocks losing over 50% of their value. Fashion retailers like L Brands (LB) and Macy’s (M) have seen their share prices hit lows not seen in years, with Macy’s losing over 50% of its value in the last 12 months and L Brands (parent company of Victoria’s Secret and Bath & Body Works) also losing at one point this year approximately half of its value (even though L Brands shares have now recovered somewhat since they hit their 52 week low of around $35 per share earlier this summer). Macy’s Versus L Brands Stock. One of the problems that many investors have had with investing in Macy’s during the past few months is that just when they thought Macy’s shares could not go any lower, the shares would take another hit and decline even further in value whenever similar mall retailers released negative news about their specific companies (think J.C. Penney (JCP) or Nordstrom (JWN) to name just two examples). In fact, Macy’s share have taken such a beating that its dividend yield is now at an astonishing 8.2% even though the company is still profitable (unlike other mall retailers such as J. C. Penney that are bleeding money with huge quarterly losses). 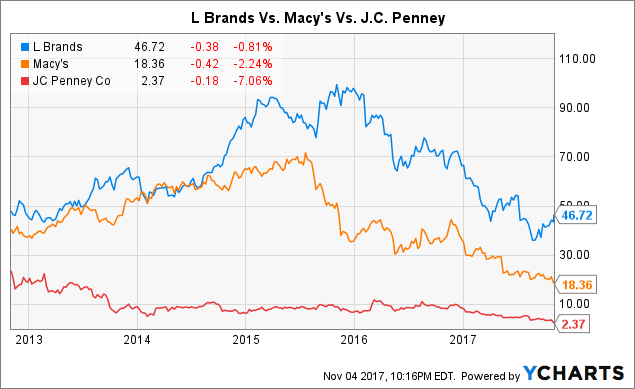 L Brands is a similar story, but as many experienced investors have learned over the years, not all retailers are created equal. L Brands (which also owns Bath & Body Works along with other smaller retailers such as La Senza and Henri Bendel) is the #1 lingerie company in the world, and its products are well protected against the Amazon effect (meaning that a large percentage of women will generally not accept a lower quality lingerie brand even if it is selling at lower prices compared to lingerie being sold by Victoria’s Secret). Thus, for many women fit and comfort along with quality will be more important than being able to purchase lower quality lingerie items at lower prices. In addition, if a woman wants to purchase Victoria’s Secret lingerie, she will generally only be able to find Victoria’s Secret products at a local Victoria’s Secret store or by visiting the company’s website simply because Victoria’s Secret products are generally not available at other retail stores (this helps to protect the value of the Victoria’s Secret brand by giving L Brands and Victoria’s Secret better control over the pricing of their lingerie and beauty products). Macy’s Versus L Brands Stock (Long Term). The problem with Macy’s is that it lacks that exclusivity of products that Victoria’s Secret enjoys. While it is true that some products can be unique to Macy’s, the vast majority of their products are probably available at other mall retailers such as Nordstrom, J.C. Penney, Dillard’s (DDS), or Sears (SHLD). However, unlike many other mall retailers, Macy’s has managed to stay profitable even as mall traffic continues to decline in many malls throughout the United States. In addition, Macy’s owns extremely valuable real estate which basically means that Macy’s investors would be getting the Macy’s fashion business for pennies on the dollar if we were to include Macy’s real estate holdings which are extremely valuable. Many investors are legitimately concerned and worried that Macy’s could decide at some point in the future to either cut or reduce the dividend significantly. However, what many investors fail to realize is that if Macy’s were to cut the dividend, the extra cash that would become available to the company could be used to reduce Macy’s debt significantly (which is a little over $6 billion dollars). This reduction in Macy’s debt would make their balance sheet stronger (making the company stronger) which in turn could help the share price in the future. Thus, a better way of looking at Macy’s as an investment is to realize that at current market prices an investor could purchase for half the price a very profitable company with significant real estate assets and a very valuable brand (it would be very hard to find someone that has been living in the United States for several years who is not familiar with the Macy’s brand). In addition, Macy’s continues to invest in its e-commerce website which as of November 2017 was ranked as the 164th most visited website in the United States (source: Alexa.com). In terms of brand power, L Brands is hard to beat. This is because Victoria’s Secret is known around the world (they have over 57 million Instagram followers and over 28 million likes on Facebook compared to Macy’s which has a little over 1 million followers on Instagram and over 14 million Facebook likes). In addition, Victoria’s Secret has the Victoria’s Secret Angels which are constantly promoting the Victoria’s Secret brand on social media to their tens of millions of followers around the world. The interesting thing about L Brands is that it doesn’t really have a problem with its business model compared to other fashion retailers (besides being in an industry that is not very much liked by investors these days). Many investors will tell you that Aerie and Amazon are formidable competitors, but the truth is that L Brands is a global brand which is expanding and opening new stores around the world. A large number of fashion retailers have been filing for bankruptcy over the past 2 years, and making things worse for L Brands was its decision to stop selling swimwear and apparel, which only added to its problems by reducing store sales compared to the previous year. Add the fact that it decided to discontinue its famous lingerie catalog (which in our opinion created huge brand awareness), and you can clearly see why many investors decided to sell the shares of L Brands first and ask questions later. In our opinion, L Brands is the better company between these two very prestigious fashion retailers, and is the company that we would select between the two if we had to purchase the shares with a very long term view (10 to 20 years). However, the shares of L Brands have already increased significantly since they hit their 52 week low of $35 per share during the summer, and thus present some downside risk at current prices. Thus, we would consider adding to our Macy’s position at current prices (less than $19 dollars per share), while also patiently waiting to add to our L Brands position if the share price dips once again below $40 per share as it did during the summer. Experienced investors that can handle the downside risk in L Brands shares could also sell L Brands cash secured puts that expire in 2018 in order to acquire L Brands shares below $40 per share even if the share price stays above $40 per share over the next few months. ZARZAR MODELS is one of the top modeling agencies for women in the United States representing models in print fashion editorials, high fashion runway, film, television commercials, and promotions. The agency represents top models in all of the major fashion cities and recruits and represents models throughout the world through its global fashion and modeling network. How Has Stephen Hawking Lived So Long With Amyotrophic Lateral Sclerosis (ALS) Also Known As Lou Gehrig’s Disease? Above: How Has Stephen Hawking Lived So Long With Amyotrophic Lateral Sclerosis (ALS) Also Known As Lou Gehrig’s Disease? Why Invest In Gilead Sciences Stock? Above: What Exactly Does The Sun Do To Your Beautiful Skin? Have you ever wondered what exactly the sun does to your beautiful skin? Join us as we explain what UV rays do to your beautiful body. These young women had no clue what the sun did to their once beautiful young looking skin. We have a range of terrible excuses for forgetting to put on sunscreen — from being in a rush, to not wanting to get our hands oily (there’s a spray for that, people), to believing that the sun’s rays are entirely blocked when it’s overcast and cloudy. Sunlight arrives on earth in three forms: infrared (heat), visible light, and ultraviolet. Fair-skinned women usually burn rather than tan in the sun because they lack melanin, which is responsible for a tan’s coloring. A fifth of adults think they can’t get a sunburn if they already have a tan. Is Tanning Ever A Good Thing For Your Body? Above: Is Tanning Ever A Good Thing For Your Body? Summer is here, and that means more time in the sun! However, most of us have been warned about the dangers of sun exposure. But our fashion models wonder, is getting that bronzed bikini body ever actually good for your health? There is a pervasive belief in our culture that a tan connotes health, affluence, wealth, and even beauty. Guess what? Tanning beds are really bad for you. In fact, many doctors believe that tanning beds are as bad for you as smoking. Why Do Baby Girls Have Birthmarks? Why Do Women Have Birthmarks? What Causes Birthmarks? Are They Dangerous? Above: Why Do Baby Girls Have Birthmarks? Why Do Women Have Birthmarks? Why do we have birthmarks? Do you have a birthmark? What causes birthmarks? Are birthmarks dangerous? ‘Strawberry’ birthmarks grow rapidly when babies are just a few weeks old. Strawberry shaped birthmarks called infantile hemangiomas grow rapidly in infants much earlier than previously thought, researchers have discovered. What are Birthmarks? The term ‘birthmark’ can refer to all sorts of spots in the human body. A birthmark is a benign irregularity on the skin which is present at birth or appears shortly after birth, usually in the first month. Birthmarks can occur anywhere on the skin. Birthmarks are caused by overgrowth of blood vessels, melanocytes, smooth muscle, fat, fibroblasts, or keratinocytes. Dermatologists divide birthmarks into two types. Pigmented birthmarks caused by excess skin pigment cells include moles, café au lait spots, and Mongolian spots. Vascular birthmarks (also called red birthmarks) are caused by increased blood vessels and include macular stains (salmon patches), hemangiomas, and Port-wine stains. A little over 1 in 10 babies have a vascular birthmark present by age 1. Several birthmark types are part of the group of skin lesions known as nevi or naevi, which means “birthmarks” in Latin. The exact cause of most birthmarks is unknown, but vascular birthmarks are not hereditary. Vascular birthmarks are thought to occur as a result of a localized imbalance in factors controlling the development and migration of skin cells.